Our pilot projects in Allegheny County, PA are underway in 2018. Starting in spring 2018, Plant Five for Life piloted their vision, planting 5,000 trees for 1,000 children born at UPMC Magee-Womens Hospital. New parents with children born in April and May received a gift of five trees for their child. 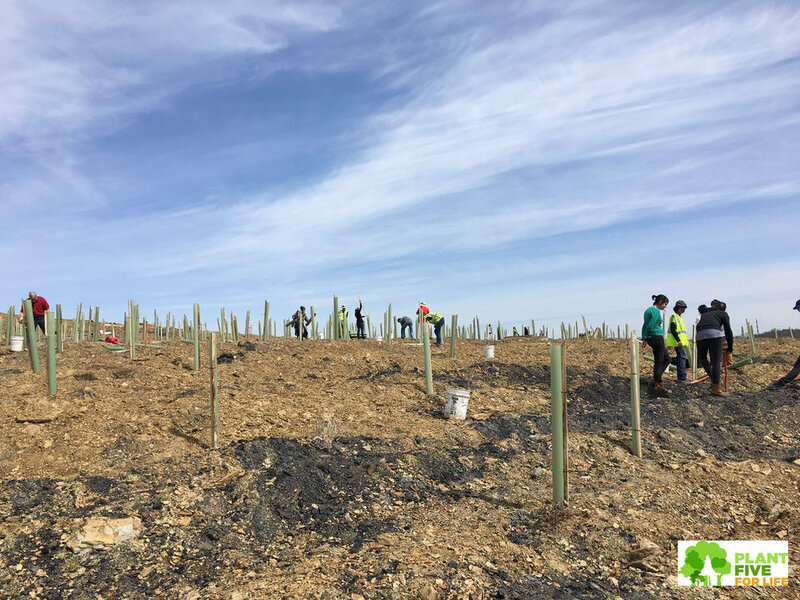 Shortly thereafter, starting on Earth Day and continuing through October, the native species were planted on a former coal mine site being restored by Pittsburgh Botanic Garden. The garden project is part of a multi-year restoration effort which has been supported by a number of different entities over the years including the Office of Surface Mining and Reclamation, Western Pennsylvania Conservancy and numerous companies and individual volunteers. The trees are returning the site to forest over time. Plant Five for Life raised and gave funds per tree to the property host, which were used to acquire and/or plant the trees, to establish deer protection and to help maintain the 5,000 trees. We communicated to new parents, assisted with the tree planting, organized a portion of the additional volunteers needed to plant, arranged sponsorship for volunteer and family day, and co-designed and implemented the preparations for a Family Celebration Day at the end of October 2018. The Family Day celebration was designed with family friendly activities to connect each family to the site, each other and to the trees which were planted for them. Plant Five for Life will continue this program in 2019. In 2019, each child born at The Midwife Center for Birth and Womens Health of Pittsburgh, PA will begin to receive a gift of five trees planted at selected sites throughout Allegheny County. Plant Five for Life is currently evaluating sites with community collaborators and potential property hosts most in need of planting in the upcoming year for stormwater management, air quality enhancement, fresh food supplementation, comfort through shade and cooling and community gathering places. If you would like to contribute to a gift of trees for this pilot, you can do so through our crowdfund or through our 501c3 fiscal sponsor's fundraising page. If you are a property owner and would like to host a Plant Five for Life planting please contact us.